Contact Albert Valley Turf For All Your Turf and Grass Needs. 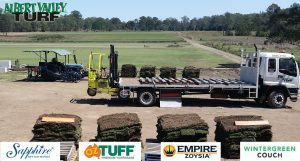 Albert Valley Turf supplies quality turf varieties that are suitable for South East Queensland climatic conditions. Contact us today. We grow four varieties – Sapphire® Soft Leaf Buffalo B12 Wintergreen Couch Empire™ Zoysia and Oz Tuff® Couch. Just choose 1 of the 4 purchasing options below – best suited to your situation. Click through on your preferred option and please read all the important information regarding our turf. 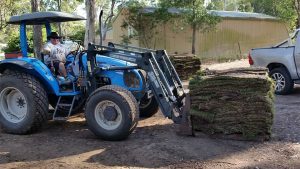 If you are picking up turf from our farm or getting supply and delivery please make sure all your preparation is done before hand so all you have to do is unload your trailer and lay straight way. Remember, Turf is a living product and much care needs to taken to ensure its transplant and successful growth. All prices include a goods and services tax or GST. All orders must be paid for 48 hours prior to delivery. Please read the below options as they contain important information / prior to making your turf decision. Inspections (for clients looking for preparation and installation) and pickups to be made BY APPOINTMENT ONLY. To make an appointment please call the office on 07 5546 4154 or click here to email us your questions to info@albertvalleyturf.com.au. We are CLOSED on all Public Holidays throughout the year. Please remember this is a Farm, so take care on arrival, watch for machinery, equipment, people and our dogs!